Monterey Park, California-September 8, 2010-The City of Monterey Park today launched its service to provide Internet of Council meetings. Viewers will be able to watch live Council meetings from any location with Internet access. City Council webcasts will provide convenient, efficient and timely means for citizens to keep informed about council proceedings and actions. This new technology will support Monterey Park’s commitment to transparency and open government. Webcasting will be a complement to the live cable TV broadcasts that the city has been offering since 1986. The city will also provide on-demand archives of city meetings beginning with the September 2010 meetings. Shortly after each live meeting concludes, the meetings will be indexed, allowing viewers to jump to particular agenda items of interest instead of watching the meeting in its entirety. City staff estimates that, following a live webcast, the meeting will be available for viewing by the end of the next business day. Citizens can also subscribe to RSS feeds and receive notifications when new videos are posted. Regular City Council meetings are scheduled for the first and third Wednesdays of the month at 7:00 p.m. in the City Hall Council Chambers. Guests and presentations meetings are on the Tuesday before the third Wednesday of the month at 6:00 p.m. Special meetings are announced as needed. Meetings are open to the public and agendas are available on the city’s website. The webcasting project is coordinated by the City Clerk’s office and the city’s government access television station MPK-TV. City Clerk staff will carry out the preparation, indexing and organization of the meeting archives. 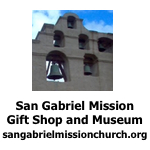 Webcasts will utilize the MPK-TV video feed that is also seen on Charter Cable Channel 3 and AT&T U-verse Channel 99. The new webcasting system is facilitated by Granicus Inc., a San Francisco-based company specializing in webcasting and public meeting management for local government. 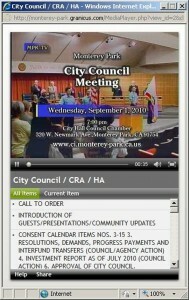 Example of Monterey Park City Council webcast of archived meeting with index points.